If I were to ask my younger self I would not hesitate to say SUMMER! With the warm weather and summer vacation, seriously, NO SCHOOL and sunny days, it was the best! As I have gotten older (not THAT old 😛 ) I have begun to appreciate each season. Each one has its charm and wonders for us to unravel. And I try to appreciate all seasons, even during those bleak winter days when the weather is gloomy and gray. But to be honest, I still have a favorite season but now it’s FALL! What is your ‘must do’ activity in the fall? 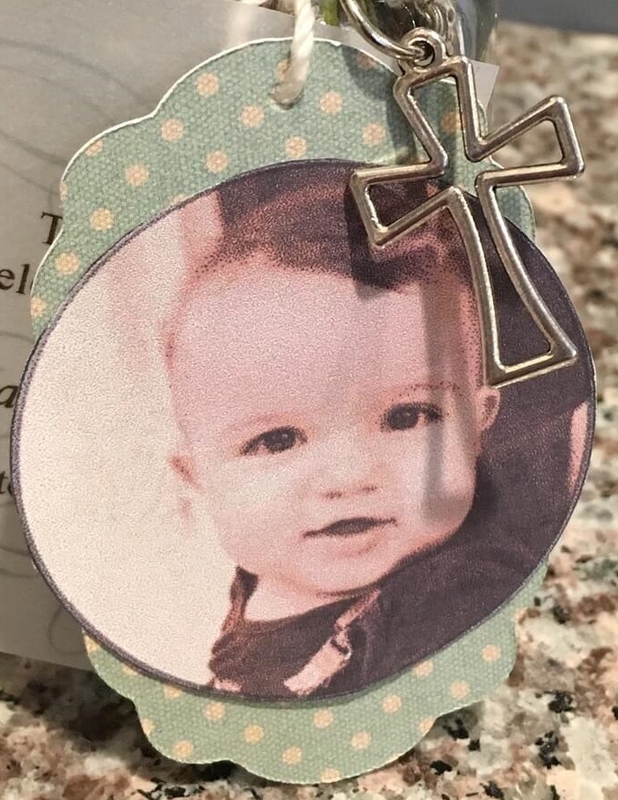 We made labels using a cricut machine and glued a picture of my son on top of the labels. The picture had been printed on regular printer paper, not photo paper. We also printed a thank you message on a separate label (we used transparent paper). 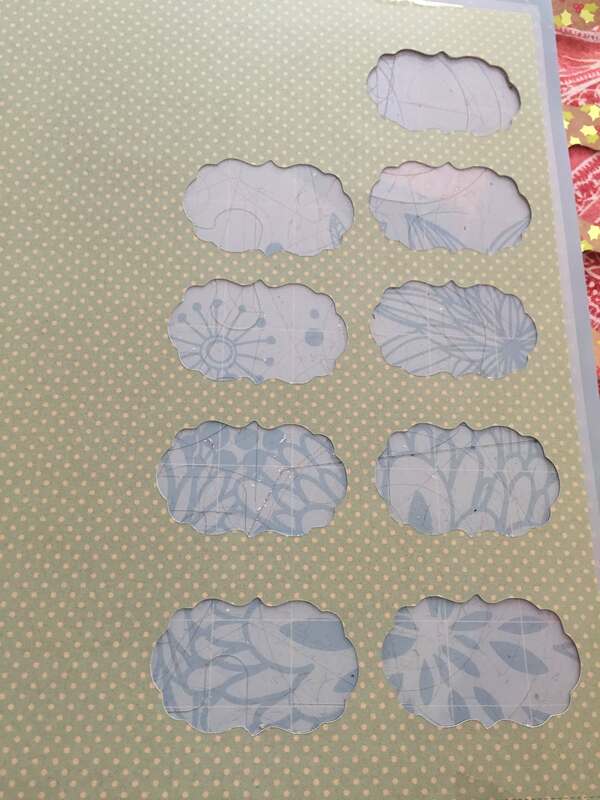 With these thank you labels we did not use the cricut machine, we simple cut rectangles. After filling the jars with the lavender, we wrapped both labels and a cross using string around the bottle’s neck. Simple and sweet. And you don’t necessarily have to use these favors only for baptism, but for any occasion! My kitchen windows get A LOT of sunlight and I was in need of creating window treatments that wouldn’t close my backyard view (as would happen with curtains). That is when we decided on making these window awnings to soften the bright sun rays. I haven’t provided measurements or quantities as it depends on the window’s length and height. The side piece is a 2×4 while the middle pieces are 1×1. Used a 1X1 piece to evenly space the middle pieces apart. On the sides, middle and top we added 4×1/4 wood. Torched the wood for dark color effect. We sprayed the wood awnings with Spar Urethane (a protective clear finish for exterior or interior wood exposed to sunlight, water, or temperature changes). We added three hinges to the top of the awning. And added metal frames under the awnings (which were originally flower hangers :). My oldest son (who will be 3 on Saturday!) loves anything that moves- cars, airplanes, trains, helicopters, motorcycles (you get the picture 😉 but he especially loves fire engines! He went through a phase that all he wanted to watch was Fireman Sam…over and over and over again… I actually had to ‘cut the cord’ before he would turn into Norman Price! (For those unfamiliar with the show, Norman is a bit of a menace ;). I was initially planning to do some embroidery- maybe around the trees and to add some grass and flowers- but as I came to find out, the fabric I was using wasn’t good for embroidery (the needle would leave big holes) so I opted gluing fabric to create the scene without embroidery. 1. The first thing I did was stitch the blue and green fabrics together. These pieces would create the background for the bigger hoop. I found these fabric quarters for 97cents a piece. Prepping for stitching. The green fabric can’t be seen here but it’s underneath the blue fabric. The two pieces have been stitched together. I unfolded the fabric and ironed to flatten the where the two had been stitched together. I stitched once again but this stitch would remain visible. 2. 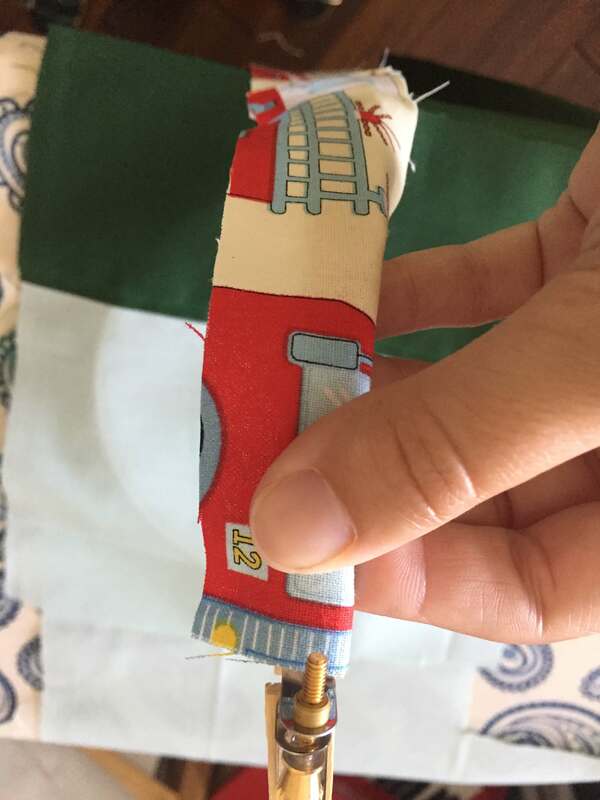 I then cut out the fire engine from the fabric I had purchased on Etsy. I was positioning the fire engine to see how it would look. 3. I wrapped both embroidery hoops with strips of the fire engine fabric. I used crafter’s glue to keep the fabric in place. 4. I placed the background fabric in place on the bigger hoop. 5. I cut out a tree truck from brown fabric I had at home. This fabric had a pattern which was perfect for the tree trunk. I then cut a piece of green fleece for the top of the tree. Lastly, I loosen the embroidery hoop and passed the excess green fleece so that the fabric would stay in place. Here I’m just placing the pieces, without gluing, to see how everything looks. 6. 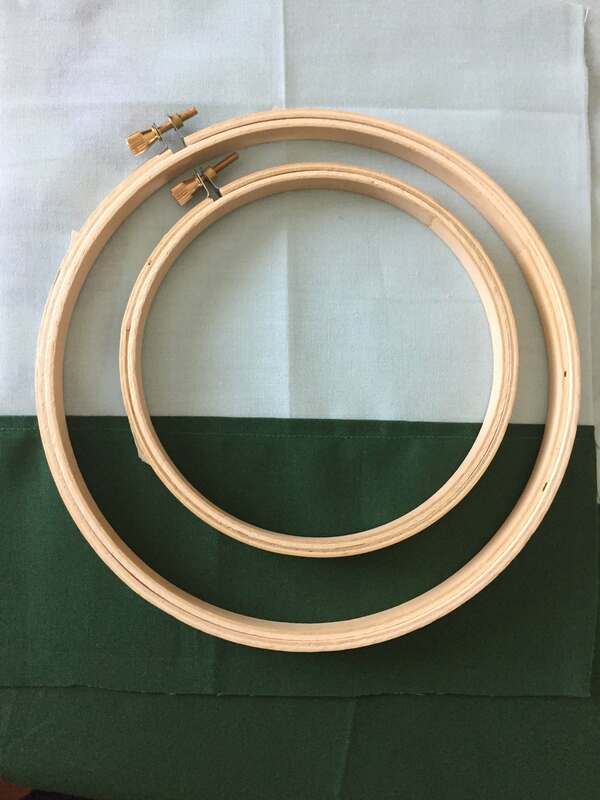 Before continuing, I cut the excess background fabric on the big hoop and did a running stitch through the fabric as can be seen in the picture below. 7. For the smaller loop, the background was only a piece of blue fabric. I cut some green fleece for the tree and cut some tree limbs from the brown fabric. Once again, I loosened the embroider hoop to pass the green fleece. I then repeated step 6 on the smaller hoop. 8. Once the trees were glued on both hoops, I then glued the fire engine to the bigger hoop and glued the ladder continuation to the smaller hoop. And to finish off, I sewed the kitty button to the tree limb on the smaller hoop.